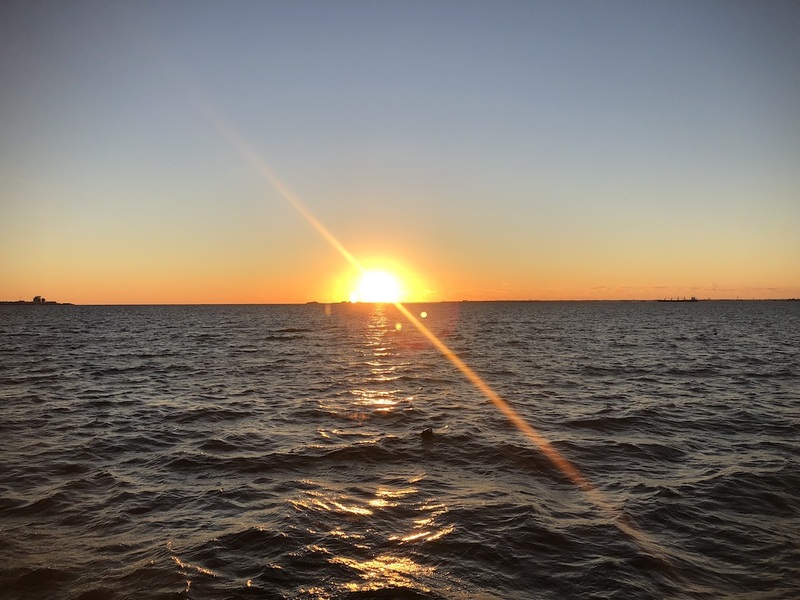 Beginning of November – the days were getting shorter and the temperatures were dropping, time to head south towards the islands of the Caribbeans. For Moonwave’s owner it’s a tradition to participate in the [ARC] Caribbean 1500 Rally from Virginia to Tortola, BVI. He has done the trip several times with his previous catamaran and we participated with Moonwave in 2015. It’s also great to have a “fix” starting time, weather permitting, to give him and his friends a date to commit to. The week before the start, Sébastien & I got to participate at the Rally events like seminars and happy hours. We got to know the crews of the different boats. The rally offered a great variety of sailing boats and owners/crews from/with different locations, backgrounds and sailing experiences. We got well integrated in the group and were also happy to share our knowledge and experience when requested. Now more details about the trip: It was an “upwind”, “upwind” and “upwind” delivery. Moonwave behaved great in the waves and upwind conditions. The new daggerboards made a huge difference in performance. This year the Rally started on time so our busy crew could make the trip. The dream team: Stephan, Olivier, André, Sébastien and Sophie. The start was on Sunday 04th Nov and it was great to see lots of boats at the starting line. The start was for us the only time for us to be close to the other boats. It was great to see everyone under sail and cheer them up as a group. For the first day we stayed close to the shoreline of Virginia and North Carolina. 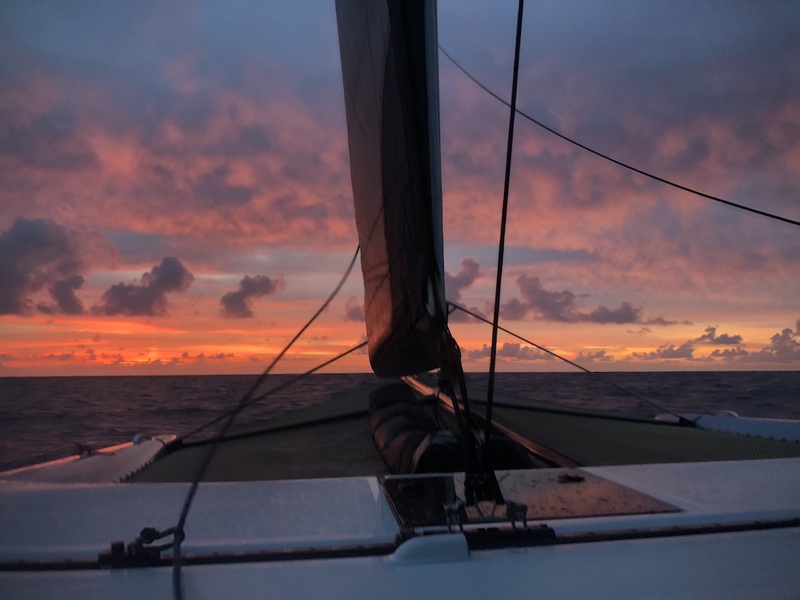 We did a lot of extra miles already on the first day as we went quiet south and waited until the wind turned from East to South to cross the Gulf-stream. The Gulf-stream offered us some “ tuff” conditions but Sebastien did great hand steering during the difficult passage. This made it as comfortable for everyone and as a short as possible. The next days the winds were lighter and Sebastien did an amazing job in weather routing. He avoided the “no wind areas” that were appearing on the weather charts and wind forecasts. We had enough wind to sail for the whole trip. There were lots of “powerful” squalls as soon as we came closer to our destination. Life on board was fun and there were good vibes even with the short nights. Stephan did a great job catching two Mahi Mahi and they were delicious. One evening Olivier “treated” the whole team with a great home cooked Ratatouille – very tasty. 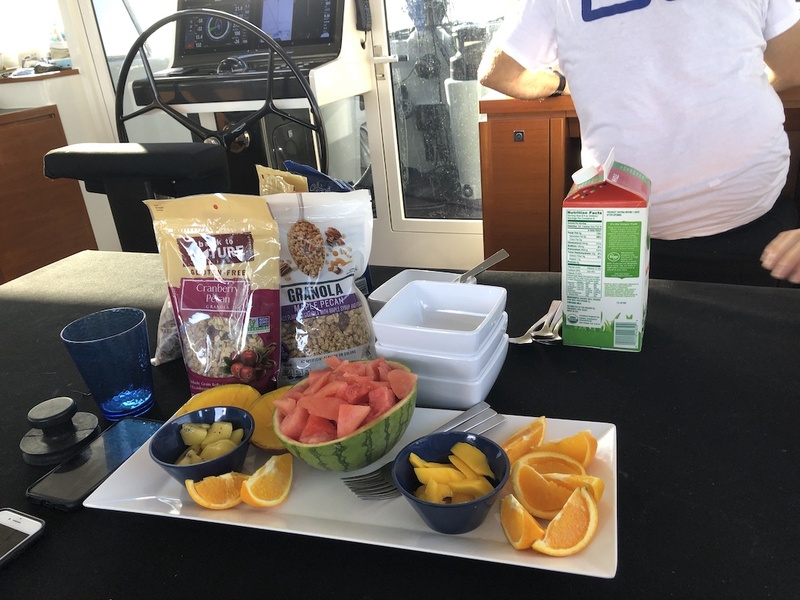 The crew enjoyed daily fresh meals on board and had a great time. 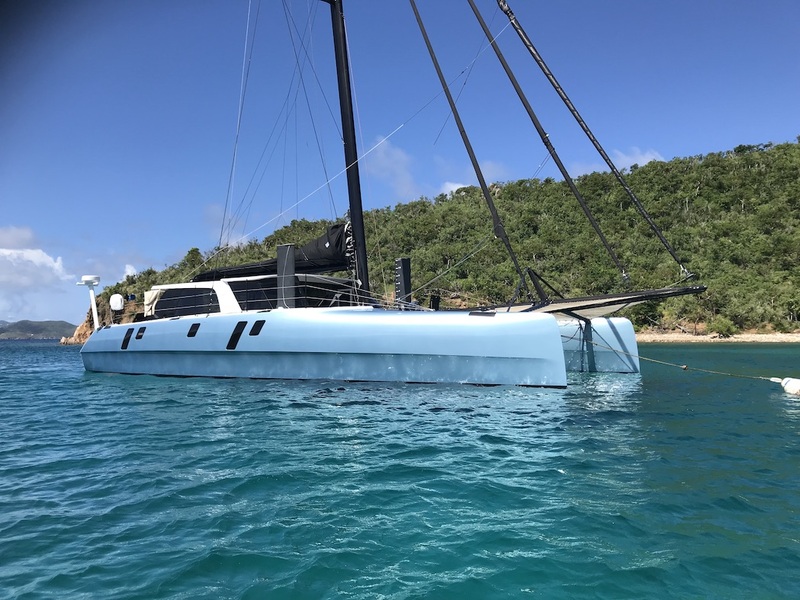 For André it was the first big passage on a multihull and he pointed out the sailing difference between his monohull back in Europe and Moonwave. After arrival in the BVI he mentioned that he didn’t want to return sailing the Baltic Sea any more. I guess he got “spoiled” by the comfort on board Moonwave, the nice temperatures as well as the speed under sail. One not so fun highlight was the breakage of the main halyard. The sail dropped in one shot. Sebastien was our “McGyver” and managed to re-splice the halyard and feed it in again. It took him three attempts up the mast to get the line back in. Luckily he had prepared a “messenger line” before departure. He was having a hard time almost 30m above the water to hold on and work as we had big waves and the mast and boat weren’t standing still. He go beat up by the motion on top of the mast and the crew on deck almost held their breath for the whole time. 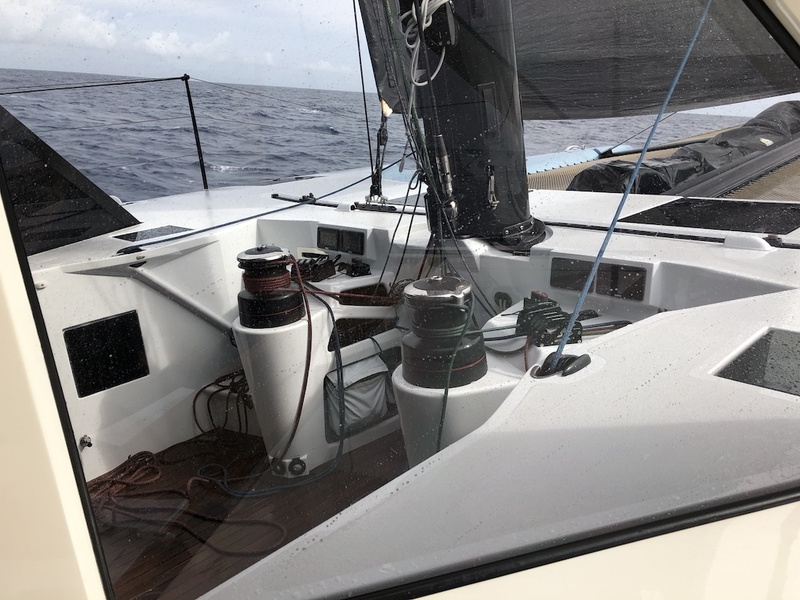 After a couple of hours the main sail was back up and we were “back in business” to reach Tortola as first boat of the group. We crossed the finish line after 7 days and 4 ½ hours with lots of extra miles but no engine hours, ahead of the fleet. 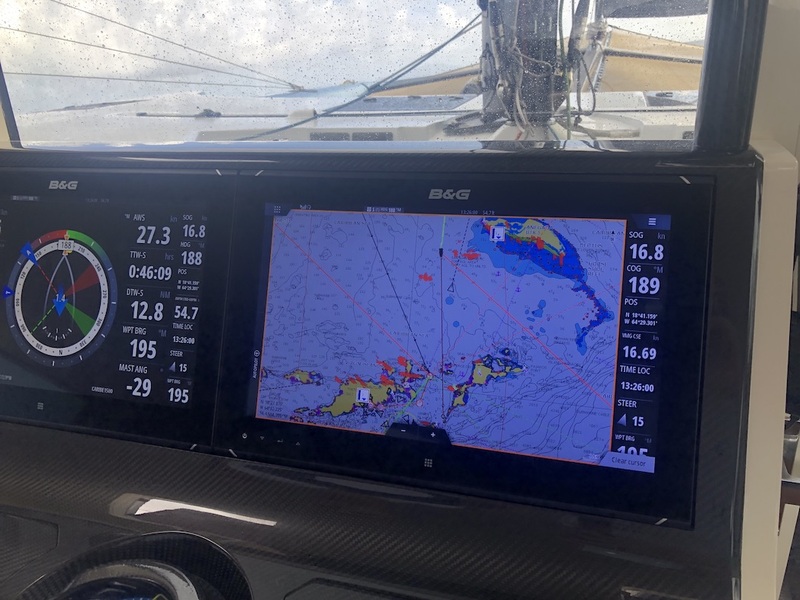 Most of the boats that have reached the BVI did a more straight/ rhumb line with usage of their engines in the no wind zones. 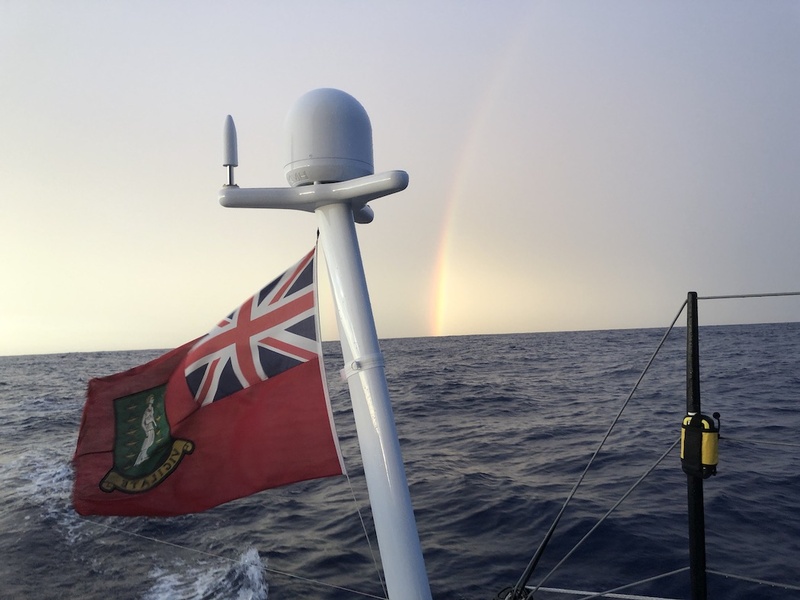 As there was some potential bad weather approaching the slower part of the fleet, some of the boats diverted either to Bermuda, Turks & Caicos or waited on the East Coast for weather or crew changes or due to technical problems. We hope to see them again during the winter season in the islands. Upon arrival in the beautiful BVI islands we first cleared in and then enjoyed the first night at anchorage. The next day we finally had a spinnaker run to Norman Island, went for a swim and the crew went ashore for lunch before docking at Nanny Cay. For the other Rally boats that arrived in Nanny Cay, we managed for most them to be at the dock upon their arrival. It was our pleasure to catch their lines at the dock. We also enjoyed meeting everyone during the social events. We want to take the chance to thank the Rally team in Portsmouth and upon arrival in Nanny Cay. It was great getting to know them or see them again. Fair winds to Darlene, Tom, Peter and Jake as well the rest of the fleet. Moonwave performed great and the modification from our recent refit in France “paid” off in a more reliable and comfortable sailing experience. Since beginning of May 2018 we have now covered about 11.500 nautical miles and we are very happy with Moonwave. Now it’s time to discover the beautiful Caribbean Islands and enjoy clear water, sun and warm temperatures.